Bender stares in shock as his lance shatters! Matt Damon, Taylor Swift, and mutant ninja turtles to star. What really happened during Matt Houston’s missing time when he had been abducted by the space aliens. The suns never set on the Terran Empire. C’mon BAEN. There is still enough room on this cover to have squeezed in a deep space fleet battle AND a sword fight. Flandry I love you, but we’ve only got fourteen hours to save the Earth. 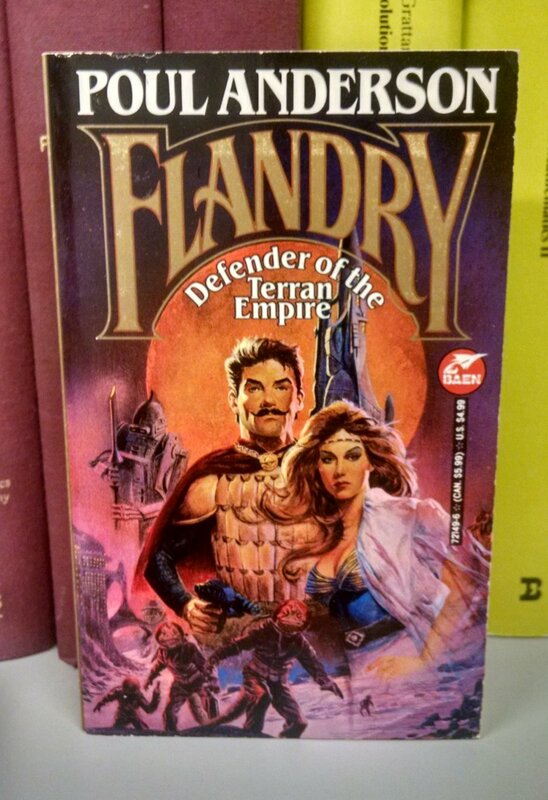 When Geraldo Rivera dreams . . . .
Flandry: Defender of the Waxed Mustache. Looks like the little lizard guy in the back has frozen his tail off. Has Bender a virgin alarm? Romancing the Princess Bride on the planet of space-newts. It must have been a horrible injury: the field-surgeon was forced to graft an eleven year old girl’s right arm on to replace the one Flandry lost, and accidentally stuck it six inches below the shoulder-socket. How did he do such fantastic feats with such spindly arms? So a damsel and a bobblehead toy in Roman-ish armour pose for a photo . . . while monstrous humanoids with glowing red eyes roam the icefields. Close friends get to call him just F.
What that stands for, well you can guess. The indisputable leader of GSS. Which makes Higgins the robot and TC and Rick newts? Flandry’s baby arm makes his weapon look bigger. Hercule Poirot, the early years! I’ll tell ya, Jane, these sea monkeys really are amazing! What about Ensign Flandry? Don’t forget about him! A relation? Ensign was Dominic’s rank before he began screwing his way to the top like Harry Flashman e.g. an adulterous affair with the wife of a rebellious Admiral in the Rebel Worlds. Aternate ending to Big: Elizabeth Perkins breaks Zoltar out of the arcade, then persuades him to lose the goatee and take up the cause of the Terran Empire.